You can't play paintball without equipment, right? 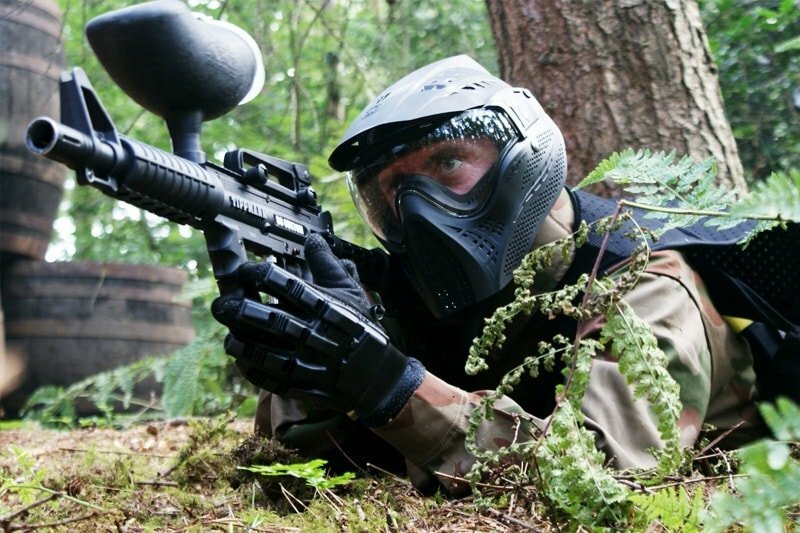 That's why when you arrive at a Paintball UK centre you'll be issued with a protective combat suit, US-spec goggles and a sub-machine paintball marker. All of these items are included in your entry fee. Additional items such as armoured gloves and upgrade paintball markers are available to purchase on site throughout the duration of the day. You can also top up your paintballs if you're running low! At Paintball UK the safety of our guests is our number one priority, which is why we use high quality, stringently tested equipment and protective clothing. Our combat suits come complete with padded neck collars and our US-spec goggles cover the whole head, ensuring maximum safety and peace of mind when entering in our game zones. Why not scroll down to check out our equipment in more detail? These hip mounted packs are a Godsend in the heat of the battle. Each pack can store up to 400 paintballs in handily sized plastic pods – perfect for reloading! Look and feel the part in our state of the art protective body armour. With rigid, plastic plates and a flexible skin, these body suits are built for both protection ventilation! Our full body length combat suits are built for both comfort and safety, meaning players can manoeuvre around our Hollywood inspired game zones safe in the knowledge that they’re well protected. Unlike standard goggles, our US spec double glazed goggles provide full head protection, protecting the head and face from all angles. The goggles’ anti fog system allows players to experience good visibility throughout the day. All of our paintball centres stock a lightweight but powerful paintball marker that’s capable of firing up to seven rounds per second. Some centeres also offer upgrade markers. Every combat suit comes complete with a fully padded collar, meaning full protection from paintballs in between the head and the torso.